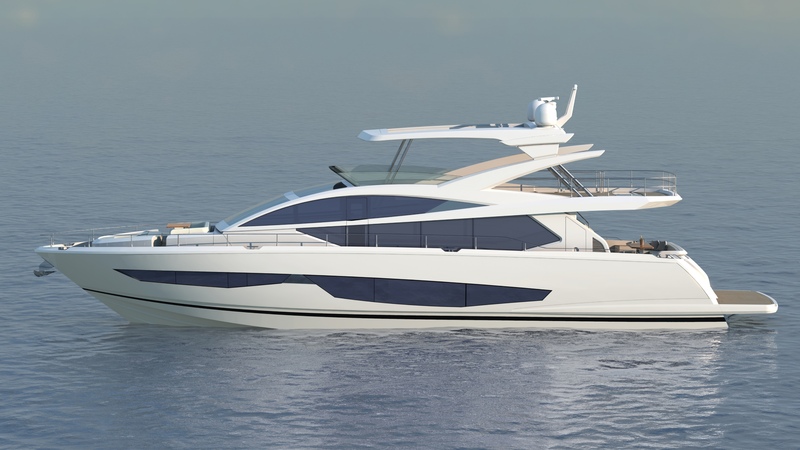 The UK-based shipyard is introducing a 24-meter Pearl 80 at the Fort Lauderdale International Boat Show. This latest version stands out as a fast and agile yacht conceived with an attentive ear to customers’ feedback. Naval architect Bill Dixon and interior designer Kelly Hoppen teamed up to deliver Pearl 80, which aims to fill the breech between Pearl 65 and Pearl 95 models.The boat’s aerodynamic hull with a white gel coat finish is reminiscent of an arrow. The yacht is offered with three alternative interior themes: the bright and fresh “Studio” with stripes and rich browns, “Taupe” in calming earthy tones and “Luxury” with chick polished surfaces, nickel, and accents of black. Her optimized layout features three external dining areas: on the flybridge, at the bow and aft of the saloon on the cockpit, as the builder is aware that guests are more likely to eat on the deck than indoors. This allows for a full-beam saloon that would be entirely dedicated to a lounging area. Private areas comprise a spacious owner’s cabin flooded with natural light from panoramic portholes on each side, two twin guest cabins with en-suite bathrooms and, finally, a VIP cabin. Following requests for more discreet service, the laundry, crew accommodation and engine room have a separate access point on the starboard side. Sun worshipers have the entire flybridge at their disposal, whilst tenders and jet skis are supposed to be kept on the stern, that can be launched without effort and thus turned into a large hydraulically lowered bathing platform, getting guests close to the water. Pearl 80 reaches a top speed of 30 knots from her twin 1,800 hp MAN V12 engines. She boasts a cruising range of 300 nautical miles at 25 knots.